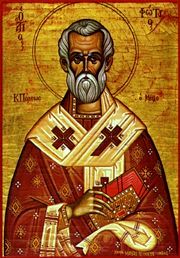 Our father among the saints Photius the Great (also Photios; Greek Φώτιoς), Patriarch of Constantinople, is considered one of the greatest patriarchs of Constantinople. His feast day is celebrated on February 6. St. Photius was condemned as patriarch by the Robber Council of 869-870, but the Eighth Ecumenical Council (879-880) affirmed his restoration to his see. Although he was accused of causing the "Photian" Schism, he was recognized as a major peacemaker of that time. He reconciled with Patriarch Ignatius, who named him as his successor (for a second time) upon Ignatius' death in 877. Photius' parents were wealthy and pious Christians. His father was attached to the imperial court with the office of "Guardian of the Emperor and the Palace." They belonged to the party which venerated icons, but the current emperor was an iconoclast and thus was against the use of icons in the Church. They were exiled when Photius was seven, their wealth disposed of, and were eventually martyred. Photius referred to Patriarch Tarasius as "uncle from his father's side,"1 and he was also related to John VII Grammaticus. He was known as one who was inclined to the quiet, prayerful, and monastic life. Byzantine writers report that Emperor Leo VI once angrily called Photius "Khazar-faced," but whether this was a generic insult or a reference to his ethnicity is unclear. As soon as he had completed his own education, Photius began to teach grammar, rhetoric, theology, and philosophy. The way to public life was probably opened for him by (according to one account) the marriage of his brother Sergius to Irene, a sister of the Empress Theodora, who upon the death of her husband Theophilos in 842, had assumed the regency of the empire. Photius became a captain of the guard and subsequently chief imperial secretary (prōtasēkrētis). In 855, at thirty-five years of age, Photius was recognized for his political skills and made the ambassador to the Persian caliph in Baghdad with the charge to negotiate an end to Christian persecution in the Muslim territories. The dissension between Patriarch Ignatius of Constantinople and the Caesar Bardas, the uncle of the youthful Emperor Michael III, concerning Bardas' illicit relationship with his daughter-in-law and other questionable moral practices, led to Photius' promotion. Ignatius was arrested and exiled to the island of Terebinthos in 858, where he submitted his resignation. Photius, a layperson, was inducted into the priesthood and made a bishop within six days and then installed as patriarch. He resisted this appointment, as he wished for a more contemplative life. He was the most distinguished scholar at that time and was seen as being above suspicion because he was strongly opposed to the iconoclast party, which had caused his parents' death. Several months after his exile, a few of Ignatius' supporters came together in the Church of Saint Irene and plotted to restore Ignatius to the patriarchate. They made an appeal to Pope Nicholas trying to discredit his rival Photius' appointment. This was signed by only six metropolitans and fifteen bishops. There were several monks in this camp who set out for Rome, even though Ignatius had voluntarily resigned. They were received by Pope Nicholas I, who was eager to assert his power over the Eastern church. Pope Nicholas had previously been successful in bringing the Western church under his absolute control, and he now sought the same power over the East. Photius convened a council in the Church of the Holy Apostles in 859. The intent was to stop the controversy about his appointment. This council found that Ignatius had not been elected by a synod and therefore his election to the patriarchate was illegal. He had been appointed by Empress Theodora. Unfortunately the Caesar Barda was vengeful against the opposition and imposed an exile on Ignatius to the island of Mytiline and persecuted some of his followers. Photius strongly objected to this action. Pope Nicholas felt that the appointment needed the consent of Rome and objected to the fact that Photius was a layperson even though there was precedence for this in both the Western and Eastern churches. He also demanded that the Byzantines give back to Rome the territories of Calabria and Sicily. In 861, with the approval of Photius, Emperor Michael convened a general council in the Church of the Holy Apostles, known as the First-Second Synod. The pope was invited, and he was glad to send his delegates. He sent them with the instruction to investigate the election of Photius in relation to the canons and and to demand that Illyricum and southern Italy be given to Rome. This synod ratified the actions of the Seventh Ecumenical Council condemning iconoclasm. Also, Photius was affirmed as the lawful and canonical patriarch. The western delegation accepted the legality of Photius' appointment. Ignatius appeared before the synod and was deposed. When the delegates returned to Rome and Nicholas found that his demands for territorial rights were not considered, he became angry and excommunicated his delegates. He convened a council in Rome in 863 in which he deposed and excommunicated Photius on the basis that his appointment was uncanonical. He chose to recognize Ignatius as the legitimate patriarch. The conflict between Rome and Constantinople reached a climax. Photius not only was defending the autonomy of the Eastern church, but also vital interests of the empire. With the full support of Emperor Michael III, he sent a letter to the pope demanding that he withdraw his decision against Photius. In 867, a council was held with over a thousand clergymen attending. This council excommunicated Nicholas, condemned the pope's claims of primacy, his interference in Bulgaria, and the innovative addition of the filioque clause to the creed. The letters of both Nicholas and Photius were read at this council. The situation was additionally complicated by the question of papal authority over the entire Church and by the disputed jurisdiction over newly converted Bulgaria. It pronounced that the Latin interference in the affairs of the Byzantine Church was unlawful. The German Emperor Louis II was asked to intervene and depose Pope Nicholas, but he died that same year. There were two emperors in the East at the time, Michael II and Basil I. Michael plotted to kill Basil, but Basil found out about the plot and murdered Michael. Photius refused to accept the murder of Michael and refused Basil communion on a great feast day. This angered Basil, so he had Photius imprisoned in a monastery. This state of affairs changed with the murder of Photius' patron Bardas in 866 and of the Emperor Michael in 867 by his colleague Basil the Macedonian, who now usurped the throne. Photius was deposed as patriarch not so much because he was a protegé of Bardas and Michael, but because Basil I was seeking an alliance with the pope and the western emperor. Photius was removed from his office and banished around the end of September 867, and Ignatius was reinstated on November 23. During his second patriarchate, Ignatius followed a policy not very different from that of Photius. This perhaps helped improve relations between the two, and circa 876 Photius was suddenly recalled to Constantinople and entrusted with the education of the emperor's children, becoming an advisor to Ignatius. On the death of Ignatius in October 877, Photius, after the requisite show of reluctance, having been recommended by Ignatius prior to his death, was restored to the patriarchal throne. Photius now obtained the formal recognition of the Christian world in a council convened at Constantinople in November 879. The legates of Pope John VIII attended, prepared to acknowledge Photius as legitimate patriarch, a concession for which the pope was much censured by Latin opinion. The patriarch stood firm on the main points contested between the Eastern and Western churches, the demanded apology to the pope, the ecclesiastical jurisdiction over Bulgaria, and the introduction of the filioque clause into the creed. Eventually Photius refused to apologize or accept the filioque, and the papal legates made do with his return of Bulgaria to Rome. This concession, however, was purely nominal, as Bulgaria's return to the Byzantine Rite in 870 had already made it an autocephalous church. Without the consent of Boris I of Bulgaria, the papacy was unable to enforce its claims. During the altercations between Basil I and his heir Leo VI, Photius took the side of the emperor. Consequently, when Basil died in 886 and Leo became senior emperor, Photius was dismissed and banished, although he had been Leo's tutor. Photius was sent into exile to the monastery of Bordi in Armenia. From this time Photius disappears from history. No letters of this period of his life are extant. The precise date of his death is not known, but it is said to have occurred on February 6, 893. Photius was long the standard-bearer of the Church in its disagreements with the pope of Rome. All agree on the virtue of his personal life and his remarkable talents, even genius, and the wide range of his intellectual aptitudes. Pope Nicholas himself referred to his "great virtues and universal knowledge." And to our souls great mercy! you are now crowned with the flowers of song. This page was last edited on February 5, 2017, at 04:45. This page has been accessed 66,416 times.